14 Montpellier Spa Road has a large contemporary kitchen/diner that comes fully stocked for those who want to cook and a formal dining room at the front if you wish to eat in elegant style. The first floor drawing room with full length sash windows looks over the magnificent Montpellier Gardens. 4 lovely bedrooms, 3 with super king zip and link beds and 1 with king size bed are situated over 2 floors. The largest 2 bedrooms have ensuite shower rooms, the other 2 bedrooms share a large bathroom with bath/shower. Downstairs cloakroom First floor laundry room with washing machine and dryer. TVs in 3 bedrooms. WiFi throughout. 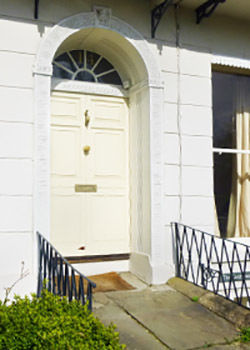 14 Montpellier Spa Road, Cheltenham, GL50 1UL is located in the heart of Cheltenham Spa overlooking the beautiful Montpellier Gardens. With free on road parking this stunning Regency town house has original features and high ceilings giving a light, airy and spacious feel throughout. The fashionable Montpellier area has a beautiful selection of fashionable shops and a wide range of restaurants, making these apartments a perfect choice for anyone looking for a serviced apartment in Cheltenham.